Authors: D. Bromwich, M. Candidi, and S. Colwell. Expert Group IPICS was externally reviewed and received outstanding endorsement from all reviewers for its continuation. Scientific Research Programme AntClim21 was enthusiastically supported by the external reviewers. 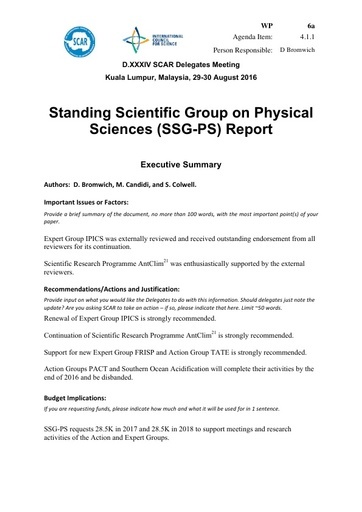 SERAnt Action Group is expected to propose that it become an Expert Group, and the terms of reference for the Expert Group are scheduled to be established in Kuala Lumpur. Renewal of Expert Group IPICS is strongly recommended. Continuation of Scientific Research Programme AntClim21 is strongly recommended. Action Groups PACT and Southern Ocean Acidification will complete their activities by the end of 2016 and be disbanded. Budget Implications: SSG-PS requests 25K in 2017 and 25.5K in 2018 to support meetings and research activities. of the Action and Expert Groups.